Optical highways for light are at the heart of modern communications. But when it comes to guiding individual blips of light called photons, reliable transit is far less common. Now, a collaboration of researchers from the Joint Quantum Institute (JQI), led by JQI Fellows Mohammad Hafezi and Edo Waks, has created a photonic chip that both generates single photons, and steers them around. The device, described in the Feb. 9 issue of Science, features a way for the quantum light to seamlessly move, unaffected by certain obstacles. "This design incorporates well-known ideas that protect the flow of current in certain electrical devices," says Hafezi. "Here, we create an analogous environment for photons, one that protects the integrity of quantum light, even in the presence of certain defects." The chip starts with a photonic crystal, which is an established, versatile technology used to create roadways for light. They are made by punching holes through a sheet of semiconductor. For photons, the repeated hole pattern looks very much like a real crystal made from a grid of atoms. Researchers use different hole patterns to change the way that light bends and bounces through the crystal. For instance, they can modify the hole sizes and separations to make restricted lanes of travel that allow certain light colors to pass, while prohibiting others. Sometimes, even in these carefully fabricated devices, there are flaws that alter the light's intended route, causing it to detour into an unexpected direction. But rather than ridding their chips of every flaw, the JQI team mitigates this issue by rethinking the crystal's hole shapes and crystal pattern. In the new chip, they etch out thousands of triangular holes in an array that resembles a bee's honeycomb. Along the center of the device they shift the spacing of the holes, which opens a different kind of travel lane for the light. 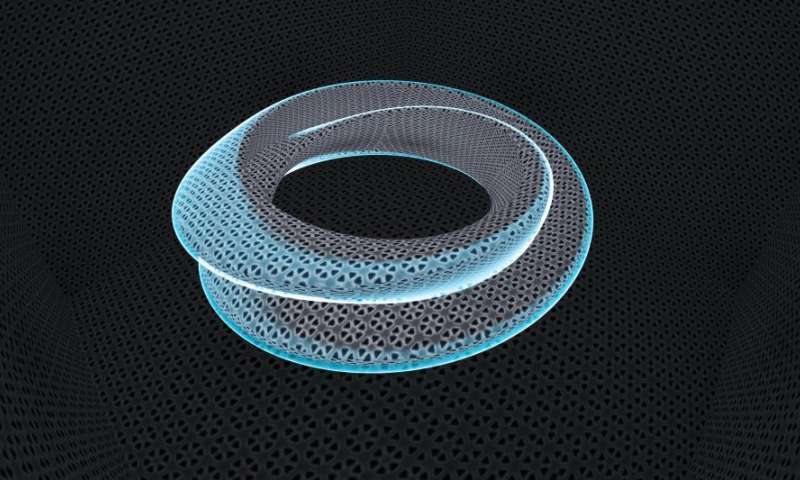 Previously, these researchers predicted that photons moving along that line of shifted holes should be impervious to certain defects because of the overall crystal structure, or topology. Whether the lane is a switchback road or a straight shot, the light's path from origin to destination should be assured, regardless of the details of the road. The light comes from small flecks of semiconductor—dubbed quantum emitters—embedded into the photonic crystal. Researchers can use lasers to prod this material into releasing single photons. Each emitter can gain energy by absorbing laser photons and lose energy by later spitting out those photons, one at time. Photons coming from the two most energetic states of a single emitter are different colors and rotate in opposite directions. For this experiment, the team uses photons from an emitter found near the chip's center. The team tested the capabilities of the chip by first changing a quantum emitter from its lowest energy state to one of its two higher energy states. Upon relaxing back down, the emitter pops out a photon into the nearby travel lane. They continued this process many times, using photons from the two higher energy states. They saw that photons emitted from the two states preferred to travel in opposite directions, which was evidence of the underlying crystal topology. To confirm that the design could indeed offer protected lanes of traffic for single photons, the team created a 60 degree turn in the hole pattern. In typical photonic crystals, without built-in protective features, such a kink would likely cause some of the light to reflect backwards or scatter elsewhere. In this new chip, topology protected the photons and allowed them to continue on their way unhindered. "On the internet, information moves around in packets of light containing many photons, and losing a few doesn't hurt you too much", says co-author Sabyasachi Barik, a graduate student at JQI. "In quantum information processing, we need to protect each individual photon and make sure it doesn't get lost along the way. Our work can alleviate some forms of loss, even when the device is not completely perfect." The design is flexible, and could allow researchers to systematically assemble pathways for single photons, says Waks. "Such a modular approach may lead to new types of optical devices and enable tailored interactions between quantum light emitters or other kinds of matter."